The first thing I noticed while reading this book was the difference between the writing compared to the Air Awakens series. Air Awakens has an easy Air to it (pun intended). 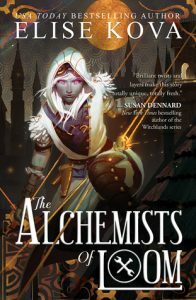 The were heavy subjects, but it was easy to read and follow, but with Alchemist of Loom it took me a while to get into this story. But man, when it grabbed me I had to read it in one go. As a Rivet in the Guild Games I was already partial to Ari, but after reading the book I’m in love with Cvareh and dearest Flor too. Ari and Flor kind of reminded me of Katniss and Prim, the kickass daring sister and the sweet girl. But Ari also reminded me of Caelena from Throne of Glass. As far as Cvaher, I loved him from the beginning. Ari hates dragons and you should be careful with them, but Cva didn’t feel like a bad soul. I was with Flor on that one. Leona on the other hand, I hated her. So much so that I almost didn’t want to read her part, but she still has this Air of vulnerability that pulled me in. Elise did the smart thing to split the pov in these four characters. It gives another dimension to the story and makes you want to read on. I don’t like the switching in a lot of books, but it worked well here. I also really love the cover! It draws me in and makes me want to read about this person. Another interesting thing I picked up on was Elise’s use of Dono and Oji. These are Japanese suffixes for respect and royalty. This is a very interesting setup for a new series and I cannot wait for part 2! There are still so many questions and I want to see so much more of this new world Elise created. If you are not in the Guild Games already come and join today! Also don’t forget to preorder! Because Elise is giving away a lot of swag! Find out more on her website. The book is released on the 10th of Januari! I need the physical copy in my hands an read it again. Join me?